United in matrimony: Barnes. | Scuffalong: Genealogy. United in matrimony: Barnes. – Scuffalong: Genealogy. 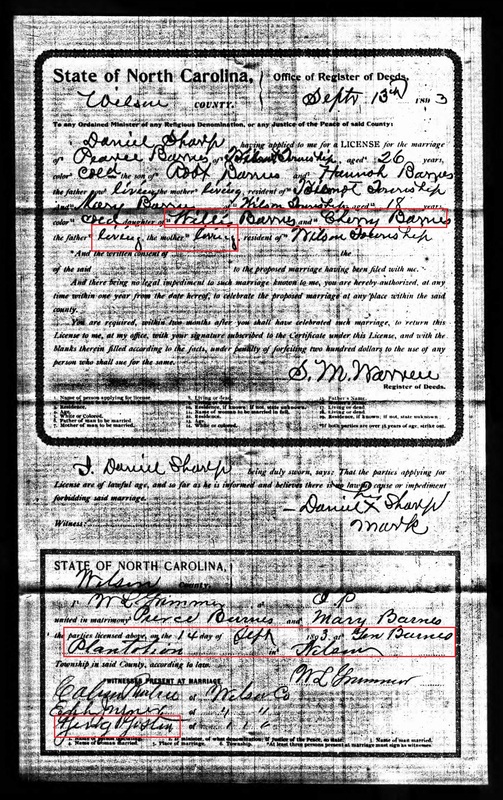 Willis and Cherry Barnes had seven children (or six, if oldest daughter Rachel was actually Wesley’s stepchild.) What do their marriage licenses reveal? I’ve long had a copy of this license. Jesse Barnes, born about 1868, was the second of Willis and Cherry’s sons. His elder brother Wesley married his sister-in-law, Ella Mercer. The official witnesses were Jesse’s brothers Wesley and Ned Barnes. Early in life, Edward Barnes went by his formal first name, but by 1900 he is inevitably referred to as “Ned.” He passed this name on to his son, who in turn begat three more generations of Ned Barneses, the youngest of whom is still living. Louisa Gay was the daughter of Samuel and Alice Bryant Gay. Her brother Albert Gay married Jesse A. Jacobs Jr.’s daughter Annie Bell. Samuel H. Vick was a heavy hitter in black Wilson. Was Spencer Barnes a relative? 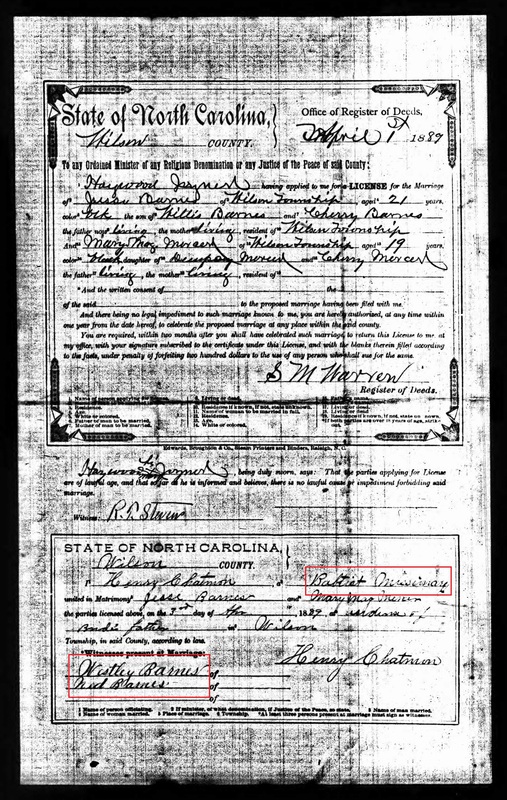 He does not appear near these Barneses in early census records, and those records and his marriage license seem to indicate that he was orphaned. Mary Barnes was Willis and Cherry’s younger daughter. 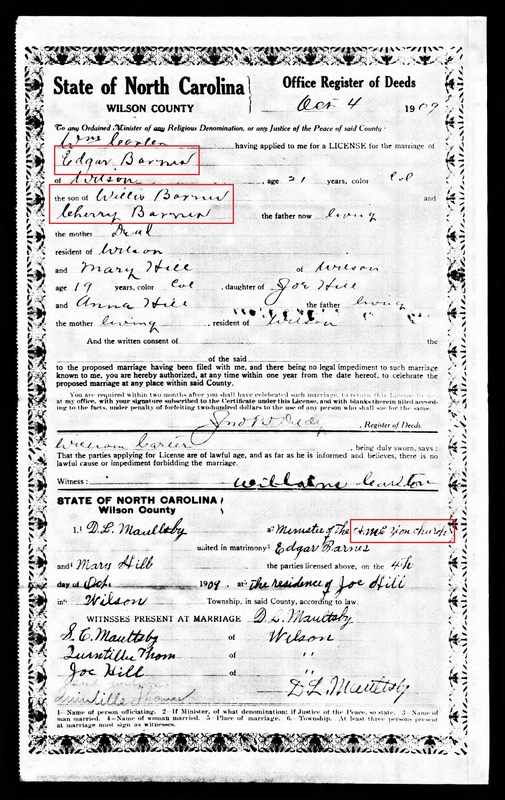 Assuming it’s accurate, her marriage license helps narrow the range of Cherry Barnes’ death from 1880-1897 (the latter is the year Willis remarried) to 1893-1897. Whoa!!! 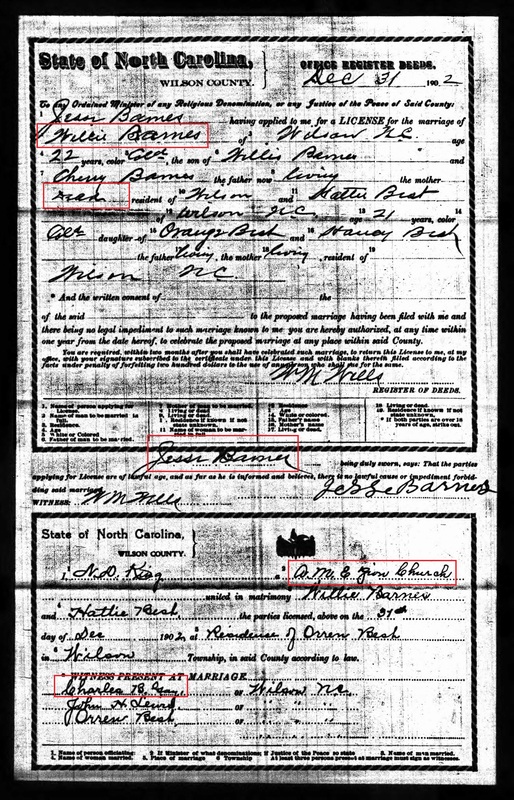 Is this verification of Hugh B. Johnston’s hunch that Willis Barnes belonged to General Joshua Barnes? Did Willis’ family remain on the general’s former plantation, perhaps as tenant farmers, more than 30 years after Emancipation? If not, why marry there? Small world moment: Duplin County-born barber and brickmason George Gaston, who lived north of Wilson in Elm City, was the great-grandfather of M.R.L., one of my childhood friends. This marriage was reported in the Wilson Daily Times. Prior to finding the article, I had not known of Willis and Cherry’s youngest child. A slight clarification for Cherry’s possible death date — 1893-1899. I do not at all understand why I haven’t seen this license before. William “Willie” Barnes was the youngest of Willis and Cherry’s sons. Hattie Best’s family had roots in Greene County, but were well-known in Wilson. This wedding took place at Orren Best’s home, but was conducted by the pastor of the A.M.E. Zion church at which Cintha Barnes married. Witness Charles B. Gay was the brother-in-law of Willie’s brother Ned Barnes. Edgar and Mary Hill Barnes were also married at Saint John A.M.E. Zion. 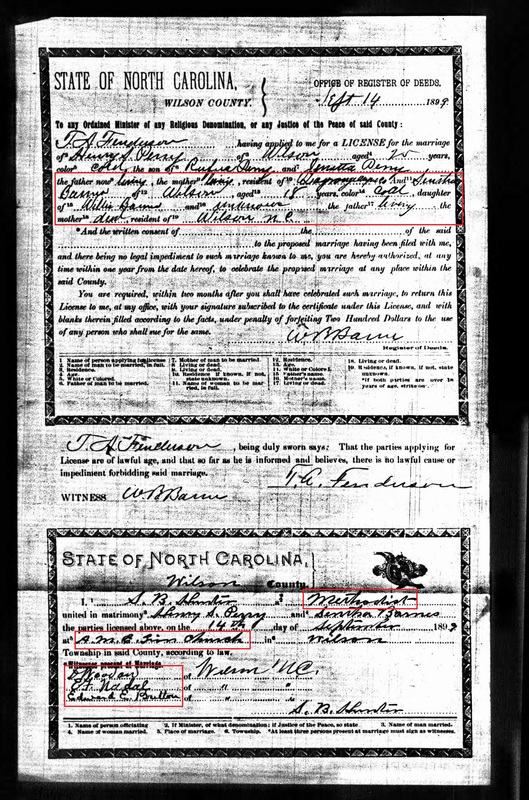 The couple is recorded in the household of Mary’s parents in the 1910 census of the town of Wilson, Wilson County. They were not married long. 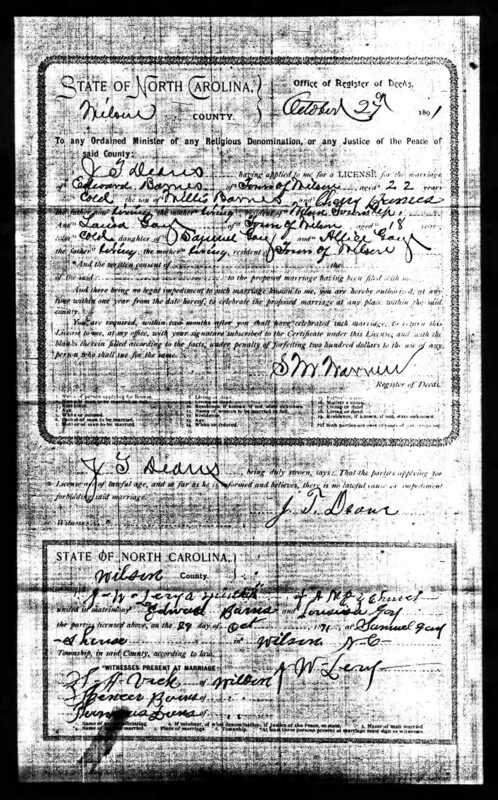 In 1917, Edgar registered for the World War I draft in Greenville, North Carolina. He described himself as single. 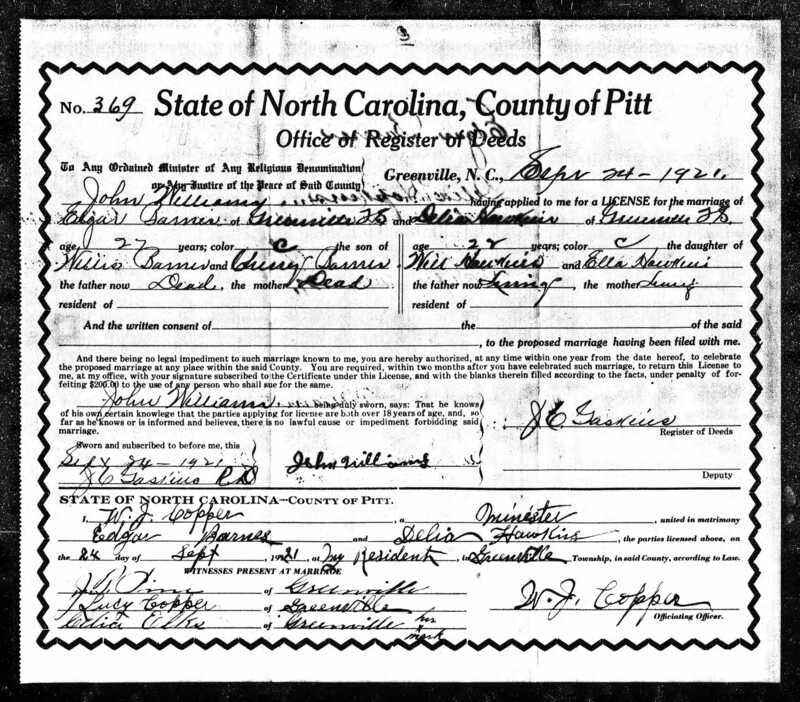 In 1921, he married Delia Hawkins in Greenville. 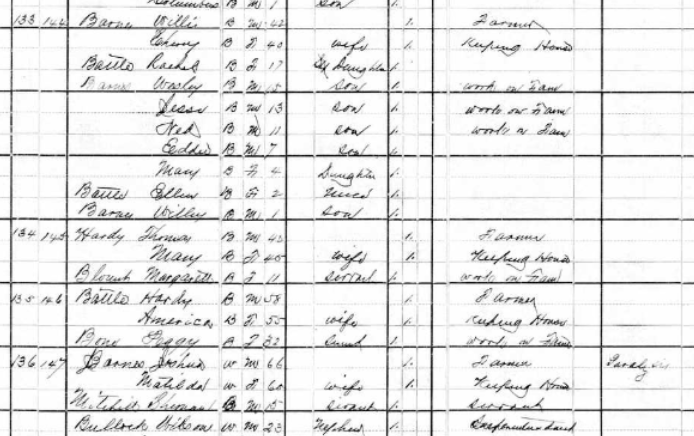 They appear as a childless couple in the 1930 census of Greenville, North Carolina. Edgar reported working as a plasterer and Delia as a presser at Carolina Pressing Club.In 1940, they are in the same house at 1311 West 4th Street, owned and valued at $2000. I have not found North Carolina death certificates for them. → That is the promise I made my father.